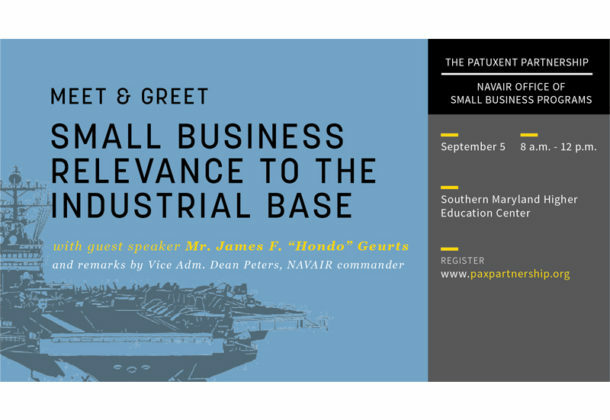 James “Hondo” Geurts will speak on Small Business Relevance to the Industrial Base at an event from 8 am to noon Wednesday, Sept. 5, 2018, at the Southern Maryland Higher Education Center, located at 44219 Airport Road in California, Md. The event is being publicized by The Patuxent Partnership. The event is being presented by TPP in partnership with the NAVAIR Office of Small Business Programs. It is a networking event that makes it possible for local businesses, elected officials, support organizations, and NAVAIR to discuss small business relevance to the industrial base and participation in the Technology Corridor. Mr. Geurts, assistant secretary of the U.S. Navy for research, development and acquisition, will be the guest speaker. Opening remarks and NAVAIR vision will be provided by Vice Adm. Dean Peters, NAVAIR commander. Shelby Butler, associate director for NAVAIR Office of Small Business Programs, will moderate a panel that includes several members of NAVAIR leadership. Panel: moderator is Mr. Shelby Butler; and the list panelists who have been invited or confirmed includes RDML Brian Corey, PEO (U&W); Mr. Gary Kurtz, AIR 1.0 Program Management; BGen Gregory Masiello, PEO (A); RADM Michael T. Moran, PEO (T); Mr. Garry R. Newton, Deputy Commander of NAVAIR; Mr. WIlliam Pearce, AIR 6.7; and VADM Mathias W. Winter, PEO (JSF). Question and answer session moderated by Mr. Butler. Register for matchmaking appointments here.